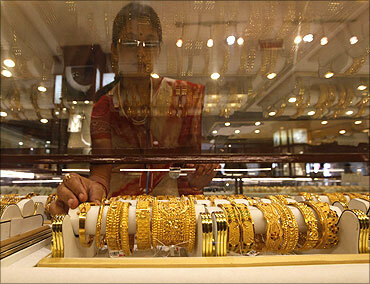 Amendments to the I-T laws do not seek to tax inherited gold and jewellery as also those items that are purchased through disclosed or agriculture income, the government said on Thursday. Dispelling rumours that jewellery would be covered under the amended law, the Central Board of Direct Taxes said the government has not introduced any new provision regarding the chargeability of tax on jewellery. During search operations, conducted by the I-T department, there would be no seizure of gold jewellery and ornaments to the extent of 500 grams per married women, 250 gm per unmarried women as also 100 gm per male member of the family, it said. The CBDT said: "Tax rate under section 115BBE is proposed to be increased only for unexplained income as there were reports that the tax evaders are trying to include their undisclosed income in the return of income as business income or income from other sources. The Bill also proposes to raise penalty under I-T Act for search and seizure cases by three-fold to 30 per cent, a move aimed at deterring black money holders, from 10 or 20 per cent currently. Once the amendments are approved by Parliament, there would be a penalty of 30 per cent of unaccounted income, if admitted and taxes are paid. This would take the total incidence of tax and penalty to 60 per cent. While proposing to amend Section 271AAB, the government has decided to retain the provision of levying penalty of 60 per cent of income in "any other cases". That would raise the incidence of tax and penalty to 90 per cent. During 2015-16, the I-T department conducted 445 searches which discovered undisclosed income of ₹11,066 crore. Total assets seized were ₹712.68 crore. Also 545 searches conducted in 2014-15 have led to admission of undisclosed income worth ₹10,288 crore. Total assets seized amounted to ₹761.70 crore. Besides, 569 searches in 2013-14 saw admission of undisclosed income of ₹10,791.63 crore and asset seizure of ₹807.84 crore. This took the total undisclosed income which was admitted during searches to ₹32,146 crore.